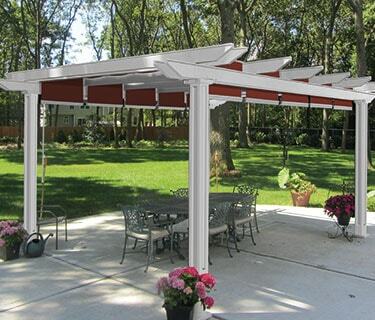 We've combined the rugged and versatile materials of our aluminum Bungalow, with the elegance and beauty of our popular Deluxe Vinyl Pergola to create our new Aluminum Pergola. This new aluminum structure with retractable canopies is available in a soft matte-finish, powder coated in your choice of black, bronze, beige or white. Custom designed for any space, perfect for windy areas and low-maintenance. These pre-cut, pre-drilled pergola kits are made of heavy, rust-free aluminum with rugged 5 1/2" x 5 1/2"" support posts that are softened in appearance on each side with your choice of recessed or flat panels. No pitch is required, with unsupported spans exceeding 20 feet. Available as a freestanding unit, or can be attached to your home or building. Beauty & shade without the maintenance of wood.